I purchased and sold my Elise s1 to JGMsports and found the process very easy and straightforward. James and I agreed a price over the phone, a deposit was paid immediately and the car was collected a couple of days later with the balance paid. There was no messing around or haggling on the doorstep, everything went very smoothly! Thanks! I found my first S1 Elise on JGM’s site. James proved helpful to evaluate the car for a remote sale via e-mail exchanges and even videos. The deal done, he delivered it to my door in the next few days. My first Elise brought from JGMsports, it was very well described, great price and an awesome car. James was very honest and showed me round the car. Top seller!! I have bought 2 cars from James over the last 8 years, both were S1 elise models. I found James very good to deal with and the cars were very accurately described and competitively priced. I would highly recommend JGM. It was great doing business with James, he was very friendly, knowledgeable and honest and when we had a few technical hick-ups with the sale he was extremely patient and accommodating. I’m very happy with the car (S1 Elise) and would recommend JGM to anyone looking to buy or sell a Lotus, or indeed anything else. JGMSports sourced me a S1 Elise 111s through a contact of his, and I must say his knowledge and expertise of the Lotus product was second to none. Anyone private or trade looking to buy a Lotus I would highly recommend getting in contact with James, even if he doesn’t have a particular car advertised he may know of one that may be available like in my case. There are not many dealers left out there who go out their way to help others especially ones in the trade, but James did I am very grateful for him doing so. I found James a great man to deal with describe the car perfectly when I got there he had a wealth of knowledge about lotus Elise every question I asked was able to answer overall a very good buying experience. James at JGMsports was very helpful in all aspects of my purchase of a Lotus Evora (my first Lotus). The moment I met him I felt at ease as he is very honest & reliable & points out every detail possible. Very professional yet friendly like we had known each other for a long time. If you are looking for something special then give JGMsports a look you won’t be disappointed. Traded in my Evora today for a Elise James had in stock, gave me a great price and the elise was exactly as he had described over the phone. James made it a smooth and easy transaction, I would recommend JGMsports to anybody looking for a good quality Lotus. 11/5/2018. Traded my 111R for a supercharged Elise R. James is a professional, and really knows Lotus with endless knowledgeable. He’s a nice guy who loves the Lotus brand and wants to sell a good car, Went out of his way to sort my number plates and install my harness belts from my old Elise. You won’t meet a more honest and straightforward person to deal with in the Lotus scene. Sold my Elise R to James today. Professional, knowledgeable and straight to the point. He made the whole process easy. 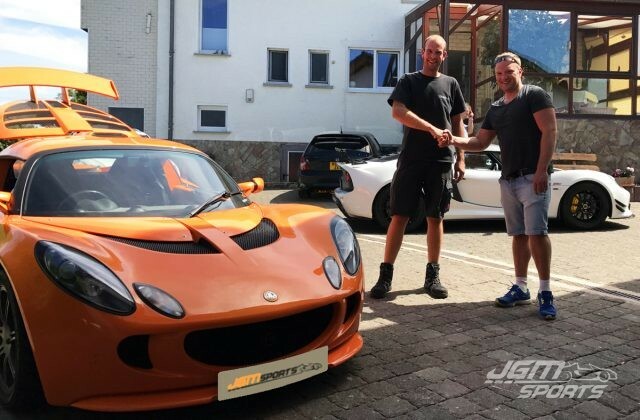 I bought my Elise S2 from JGMsports and the process was very straightforward: James sent me some pictures, we agreed for the price, I made the payment, my carrier came to James’ place to collect the car. I could not came to see the car, so my decision was based on the information that James gave me. Once received the car, it was great, exactly as in the pictures and as described by James. It was a pleasure to deal with such an honest, competent and helpful person like James. I had been on the look out for an early S1 Elise with MMC brakes as an investment for a while and JGMsports sourced exactly what I was looking for. I had the car delivered and it was exactly as described with great communication and photos throughout. Would definitely deal with again in the future. Pleasure to deal with James, all items were as described and was helpful! Will deal with him again no problem. James of JGM contacted me straight away when I had left an enquiry about an Elise. He sent extra photos and even took a video of starting the car and quick look around for me. He was straight forward and honest about the car. We agreed a deal and he arranged delivery at a very, very reasonable rate. 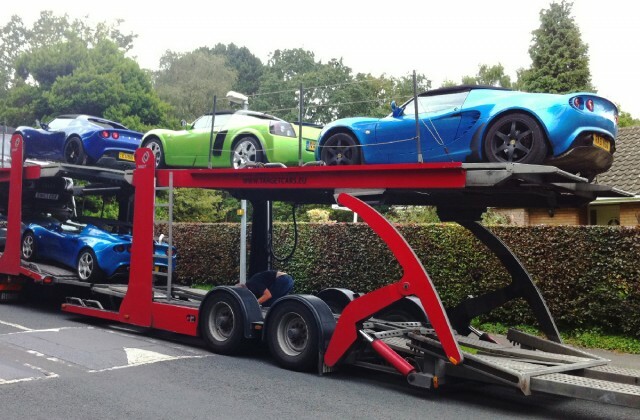 On the morning the car was picked up from him, he sent a pic of the being loaded onto the transporter… 6:30am! Dedication! The car arrived with me at 11:15am and was exactly as described. Buy with confidence, this guy is amazing! The car is great, fantastic service! Thanks! After years of thinking about buying a Lotus I made the decision of buying one and dealing with James it was a pleasure to deal with him very helpful honest and a car just as described. Bought a few cars from James over the last 10 years and I have always walked away with a smile on my face. Honest and knows Elises like the back of his hand. Will buy another no doubt at some point in the future. JGMsports were a pleasure to deal with. Agreed a great P/X deal over the phone and concluded the sale a few days later. Would highly recommend! I recently bought a Lotus Elan M100 from James. I saw the car on the Internet and with all the information that was provided by James via email I decided to travel from Essex as I was that confident that the car would be as good as it was described, which it was. Great car, honest sale and would highly recommend James. When I decide to get a S1 or Esprit, James will be the first person I contact. Dealing with James (JGMsports) is a real pleasure. He is quick responding emails, the information he supplies about the cars is spot-on and he makes the whole process nice and easy, despite being in different countries. The car is just as described and I will certainly be doing more business with James in the future. Highly recommendable! The S1 is in superb condition with low mileage as discribed, Would defiantly recommend James to others. Dealing with James was very straightforward. I bought the car over the phone on his photos and description and everything was as described. A pleasure to deal with and totally professional. Great, knowledgable service from James from the point of first contact through to collecting the car. The car is exactly as described and sale was handled in a professional but friendly manner. I really wanted another S1 Elise having owned one from new some years ago. James had exactly what I was looking for and handled the supply very knowledgeably being a complete enthuast for the marque himself. He described the car very accurately, did everything he said he would and more. He also has helped with a few tecnical queries after the sale and has really made this purchase live up to the dream; after all these machines are bought with the heart. If you are in the market for one of these cars I would highly recommend that you speak to James, he really will look after you. Just bought a Lotus Elise S1 from James at JGMsports. The car is a little bit of a project and hope to restore it back to it’s proper JPS glory with some extra breathing on the engine along the line but with regards to the purchase, James is a great guy and has an obvious passion and really cares for the cars and shares this with his customers. If you are looking for a good honest car then give him a call . 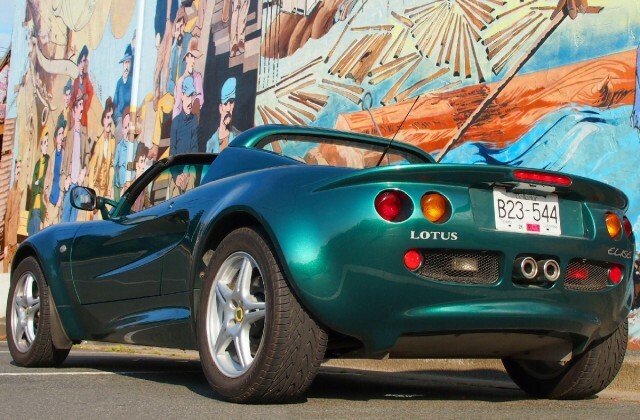 I had the great pleasure of being contacted about a Lotus Elise that we were selling for a client of ours. Right from the initial contact James was upfront, friendly and very straight to deal with. This continued all through my dealings with him. We struck a deal and he was here to collect the car exactly when he said he would be – something very rare in this industry. Thoroughly genuine chap and I very much hope that we have the opportunity to work with him again! Well where do I start. Bought the car off the internet unseen and relying on the information James gave to be correct, and being from another country I was a little apprehensive. Once James had gone out of his way to collect me from the airport I needn’t have been, on viewing the car it was even better than he had described in numerous calls and emails. This guy knows his Lotus Elise’s and I will have no hesitation in recommending him and hopefully I’ll be dealing with him again in the future. An absolute gentleman to boot. I bought a lovely S2 Elise from JGMsports. James was courteous, knowledgeable and above all honest. He paid for a full C service to be done on the car as well as a replacement alternator. This was all included in the purchase price. I have no hesitation in recommending James to any prospective Lotus buyer. This is my first Lotus and I’m afraid I may be hooked! James was a straight forward and refreshingly honest chap to deal with, helpful, all the information you could want and what you also needed to know if you don’t know everything. I bought from the internet and the car was delivered, exactly as described couldn’t be happier and will certainly use again. Buying an 18 year old Lotus, off the internet, sight unseen and from someone you’ve never met 250 miles away? What could possibly go wrong??? Well, if you buy from James…nothing will go wrong. The whole process, from first phone call to delivery of the car by flat bed to my home was painless and hassle free. James sent me multiple, detailed photos of the Elise with a very honest appraisal of the condition of the car. He sent regular updates on the progress of tyre fitting, servicing, MoT and delivery. He really made me feel part of the whole process. Nothing I asked was too much for him. Best of all, upon delivery, the car met and even exceeded our expectations. Thank you James. Made purchase of my new Lotus very simple and hassle free and even helped me find a good transport service to deliver my car that offered a very competitive quote. Would recommend to anyone looking to buy or trade in. Phil. If you wish a good Elise then first you need internet and second meet James. I buy from Spain a Lotus without seeing the car it has been a great experience with James. He did the LHD conversion and solved every problem and he delivered at home after everything was OK. To find a good relation between price and quality its difficult because when car is in really condition then is expensive, James has good prices and really good cars. He explain car condition in a very concrete point and you realise when you see the car everything its true. After all I only have to enjoy my new yellow toy!! Thanks James! Thanks, James – great S1 I just bought from you. Very good sales service and practical advice on driving and ownership – no unnecessary hype, just enthusiastic, knowledgeable pointers and no over-description of the car I chose. Car drove exactly as we discussed. Appreciated also you fitting around my timescale. Strongly recommended. Cheers! I purchased a Lotus Elise Sport 160 from James in January 2016. 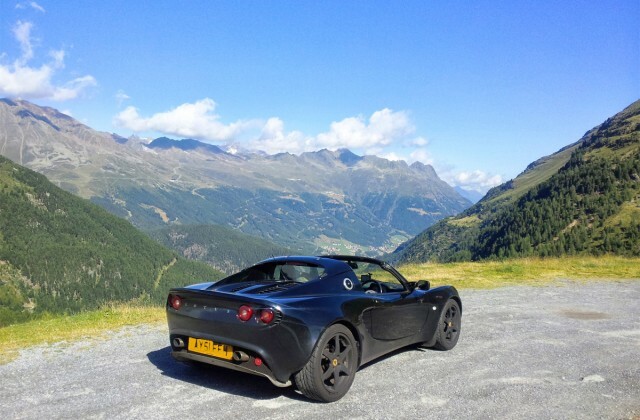 Having searched for seven months for one, I had viewed a number of Sport 160s from private buyers and dealers, and James stood out as being absolutely hassle-free to deal with; especially compared to the bigger names in the Lotus-world such as B&C. What sets him apart is that he thinks from the buyer’s perspective. He appreciated the length and expense of travel I had to go through to view the car and went the extra mile with gestures such as first-refusal and removing the advert online even before viewing the car. His knowledge of Elises instils confidence in the purchase. Even when I had trouble with the car after purchase, James again went above and beyond to diagnose and remedy the issue. Having always been reluctant to buy from a trader, I wouldn’t hesitate to deal with James again – a true specialist. Straightforward and efficient transaction. James is a bit of an Elise whizz! I would recommend to others. Bought a smart car, very pleasant and genuine person to do business with. Thanks James. You made my Lotus purchase a stress free experience. Pleasure to do business with a genuine, friendly chap. Great communication and knowledge of the Elise cars. You have been very helpful, Much appreciated. Thank you James. I was comfy in your presence and manner of trading. Will now always brouse your web site. Very helpful on the admin paper with me. Cheers and Ta. Terry L.
Hi James, It was a pleasure to deal with you ,very good communication, easy to talk to, most of all a very honest gentleman which is rear these days , thanks a lot all the best. Great service and quick deal. Thanks. 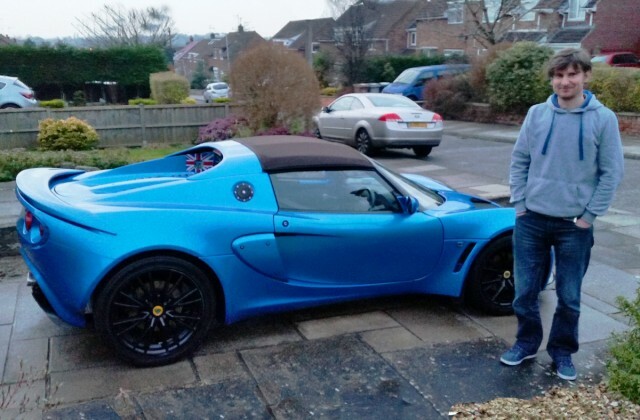 I recently sold my Elise Sport 160 to James. A very simple and straightforward process, made all the easier by excellent communication and service. James came down to view the car at a time convenient for me, and we agreed a fair deal with payment transferred instantly, all completed within an hour. Well recommended, thanks James. James responded to my wanted ad on Gumtree for a decent S2 and was true to his word when he delivered a superb example of a well cared for and genuine car. Whether you are buying or selling you will be rest assured of an honest and well informed sale. Very helpful and informative, great communication throughout sale and afterwards. The car described by James over the phone was proven very accurate when viewed in person making the purchase a pleasure from such a dedicated enthusiast. Recently sold my S2 Type 72 replica to James. Great communications, and excellent service. Funds transferred there and then, with no delay. Great chap to deal with, and highly recommended. James is a genuine and patient seller. 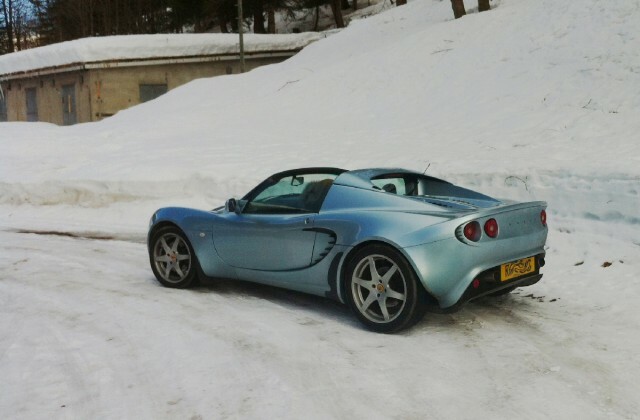 We bought a Lotus Elise S1 from him for one of our customer and the car was as described. We look forward to doing more business together in the future. I have recently bought an Elise S1 from James, and everything has been very well. The car is as described, the deal has been fair and efficient… and it was even a sunny day ;). James is definitively to be recommended! I just bought an 2002 Elise S2 from James. I couldn’t be happier! A deal with an honest man who presented good service and the car was delivered all the way from England to Denmark. I recently sold my Lotus to James. He was on time, a very pleasant and knowledgable chap, the entire deal was vey straight forward, a sellers ideal buyer. A pleasure to deal with. James is an excellent buyer I would recommend him to anyone looking to sell. I bought an Elise S1 from James, very cool guy, easy to contact, very helpful, honest. The car is very good, he is very familiar with Lotus and gives good advice. You can trust him completely. If I have to buy a Lotus once again, I’ll come back. Great deal! Was looking to get back into an S1 Elise again and JGMsports got back to me with exactly what I wanted on spec and budget. Pictures and documentation all sent prior to the deal being made as I work abroad to confirm condition of car. It was delivered as promised on schedule to my UK workshop, I couldnt be happier with it and working with JGMsports was easy. Let the racecar build commence! Great service, second car bought and traded first car back, couldn’t be happier with the purchase. Just purchased a high mileage Elise R from James. Delighted with the car which was exactly as described. James supplied me with many photographs of areas of the car and relevant paperwork which reinforced that I was making the right decision over the phone. He met me at the airport and was very helpful and trusting. I would have no hesitation in dealing with him in the future and would certainly recommend him to anyone wanting to purchase from him. Thanks James. During the process leading up to the delivery of the vehicle, James was happy to send me additional photographs of various areas of the vehicle that allowed me to take the decision to press on and buy the car. So far I am delighted with my Lotus. I would have no hesitation in dealing with James again in the future. Excellent! A professional and helpful service. You couldn’t ask for a more knowledgeable and fair company. Arranged a viewing, arrived on time and with the right attitude. A pleasure to do business with. Wouldn’t hesitate to use again for a sale or a purchase. Will definitely keep in contact. Thankyou. I’ve never been one for leaving feedback before in anything. But buying my Lotus from James this weekend has changed this. He was pleasant, genuine and told me everything about the car and kept me up to date. He even delivered the car for me which helped me out greatly. I wouldn’t hesitate in buying another Lotus off him. In fact he would be the first person I contact in finding one for me. And again I must say thank you James. An excellent buying experience; the car was exactly as described with all the information I requested provided promptly and with extra photos as well. Timely, polite and reasonable, would definitely recommend. Many thanks James, you took all the hassle out of me selling my car. Very easy and straightforward to deal with. Will definitely be recommending to other sellers. I bought the Smart Electric Drive. The car was exactly as described and a straightforward purchase, will deal with again. 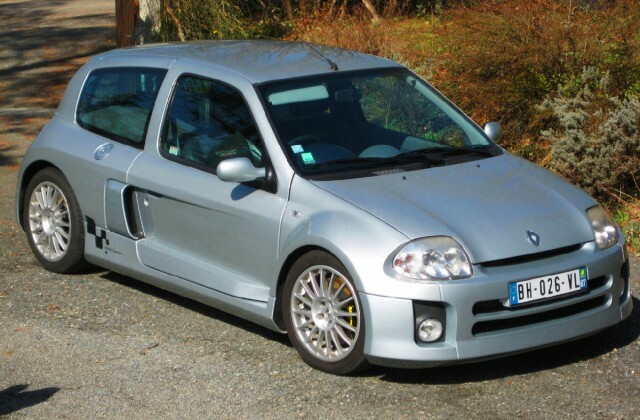 I have bought 2 Clio V6’s from James. Found the cars to be exactly as described. Very amiable person, straight forward to deal with. All the cars were delivered to France no problems at all. Highly recommended service. I have purchased three Elises’s from James at JGMsports and have been very happy with all three elises , very pleasant to deal with and would not hesitate to deal with him again in the future. I’m happy to say that you’ve been a pleasure to deal with – reasonable, affable, knowledgeable, communicative and punctual. Pleasure to do business with. 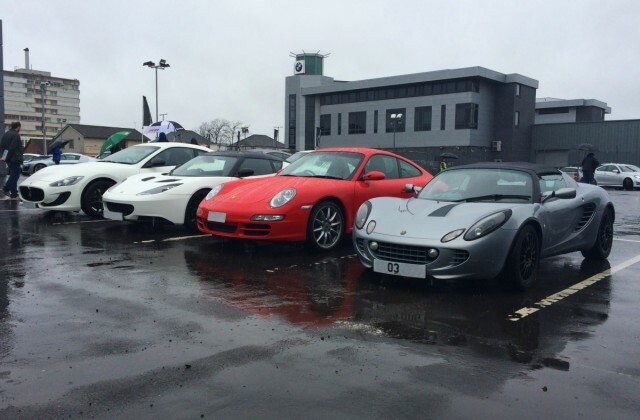 JGMsports has bought three Lotus Elise’s off of me over the years at very reasonable prices. All three transactions were pleasurable and hassle free. Removed the inconvenience associated with selling privately, would definitely use again! I purchased a lovely S1 Elise Sport 190 from JGMsports. I found James knowledgeable, honest and helpful. The car was exactly as described and the purchasing experience straightforward. I would happily purchase another car from him. I’ve sold two cars to James. Excellent buyer, turns up on time, money transferred without fuss, always polite and a pleasure to deal with. Hi James, Thanks for the supply of the Lotus Elise 135r, it really is a great little car. It was nice to do business with someone who is both enthusiastic and accommodating. An excellent customer focused business to deal with. Extremely friendly, very pleasant and helpful. 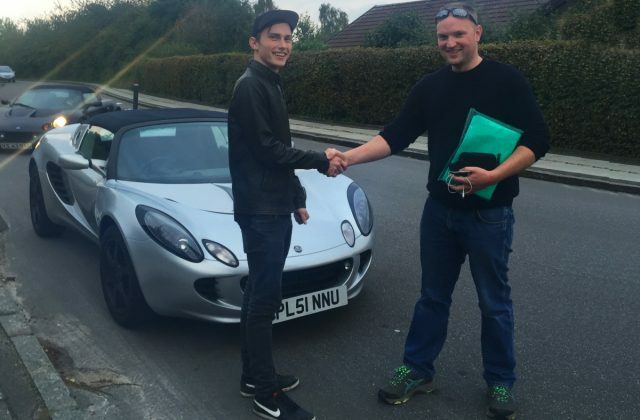 James delivered my Lotus Elise Sport 135 after fitting a performance induction kit and a new alternator. Prior to making the journey additional photographs, service history, repair bills where all sent via email ensuring the car was exactly how described. The car was delivered by James himself, as promised without any issues. Overall the service was very relaxing creating a nice atmosphere with an excellent price to match making it one of the most competitive S2 Lotus Elise’s on the market. I am very pleased and have no hesitation in recommending JGMsports and would definitely purchase another car from James. A great chap who is very knowledgeable and a great help. Many Thanks Deen. I needed to sell my beloved Lotus Elise Sport 160 in a hurry, I have known James for a while, purchased a hardtop and done previous Lotus events and track days with him in the past so he was my first port off call. As mentioned I was looking for a fast sale to invest in my business and one hour later the funds were transferred and the car collected. Great to deal with and a true Lotus enthusiast. I recently had dealings with JGMsports in selling my Lotus Elise Sport 135. James was professional and easy to deal with. The deal went through without any trouble. The money was transferred into my bank when James said it would. I would have no reservations in recommending him. Thank you Sue. I´ve bought over 15 cars from James. Every time everything was as it should. Great! Dealing with James was an absolute pleasure, the transaction couldn’t have been smoother or easier. I found a trader like a James and I was lucky, he was recommended by a friend also in Italy. My Lotus Elise is perfect and James is a gentle man and he sells cars only in good order. Thank you again James. It was a pleasure doing business with James. Quick response to my questions, and the Elise Turbo delivery right to my door. I wouldn’t mind buying another car from him. Regards Kenneth. I hope your journey home was a good one. I would just like to thank you for your professionalism and honesty during the purchase of my Elise. From the moment we first spoke to the minute you took the car, the price we agreed over the phone was the price you paid without any attempt to barter once you had seen it. From my experience over the last few days and the dealers I spoke to on the phone you were the only one willing to pay a fair price and not want to mess me about. Many thanks again Darren. James was very professional and did not pressure over selling price of my Lotus. He flew to Jersey channel islands where I live on the date we agreed was on time and very organised all done in a matter of half an hour, all very painless would not hesitate to do busy with James again in the future, infact I will! 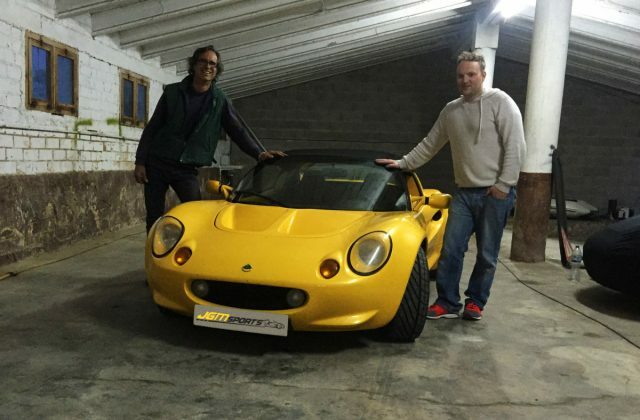 I sold my Lotus Elise to James. Throughout the transaction he was polite and courteous. Monies were received promptly and car collected exactly when he said it would be. A pleasure to do business with. I bought an Elise from James in December 2013, a lotus it’s really great. James is a very good seller he brought my car to Roscoff, France. Thanks again for the sale I will return in the next 2/3 years for a another purchase I think, cordially Karine. Purchased 4 cars from James all delivered to Italy, Yes no problem! Best seller, best cars, also cheap and nice nice person! Thanks James. Dealing with JGMsports was easy clear and quick, honest communication, and quick payment, would recommend them to anyone selling their vehicle. I bought my Lotus Elise from JGMsports in 2011. James brought it to my home to view, which was excellent service and saved a lot of driving around. The car was great, so I bought it on the spot! James at JGMsports comes highly recommended. Reasonable pricing, prompt communication, and great patience (answering questions I am sure he has answered a thousand times) made the transaction a pleasure. The car came delivered exactly as described and now will always be the first road-legal Elise S1 in Canada! I couldn’t be happier! Bought a Peugeot 205 GTI 1.9 off JGMsports and the car is in exceptional condition and being mega rare non sunroof version was exactly what I was looking for. Would highly recommended. I recently sold my Lotus Elise to JGMsports, unlike some other car transactions I have experienced it was pleasantly executed, no fuss and very businesslike. 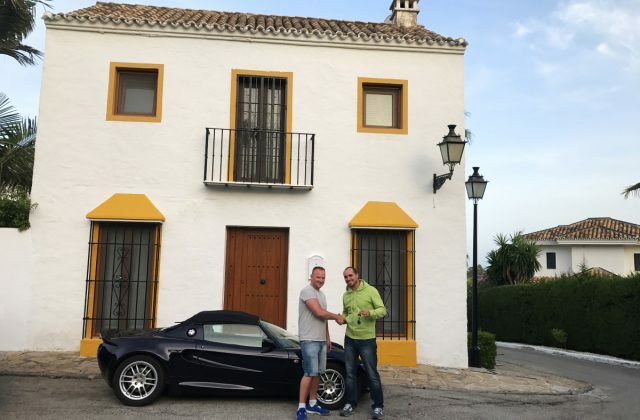 Obviously James was familiar with the Lotus brand and the detailed inspection was undertaken in a professional manner but with a pleasant rapport and the deal finalised relatively quickly. Would certainly recommend JGMsports to any of my car enthusiast friends. Many thanks for being so helpful and professional when I bought my 2 Lotus Elise’s. The entire process was easy and your friendly and courteous approach to everything made the experience most enjoyable. Would certainly recommend JGMsports.co.uk to others looking for genuine cars. I have purchased 2 cars from James (November 2010 and June 2012). Both cars delivered to the south of France with no problems. Serious professional seller that gives all the details requested and meets the delivery dates. Hoping to deal with him again soon. James bought my car hassle-free in less than 24 hours of first contact for a very fair price. He didn’t even bat an eyelid when the battery died on my drive! I will certainly be contacting him next time I have a car to sell.